How much are you looking to spend. As little as poss...Two ways round what I am trying to do...Just 16" tyres,but I have been told that 17"'s will fit and better,so 17's with wheels,pref in black...What you got ? 17's in black (paintwork scabby) good tyres all round with max 5mm tread.minimum 2 1/2 mm. Need a tidy up. Direct classic fitment. Clear 4 pot's. Haven't got any for say was just wondering so I could point you in the right direction. The ones above seem good. Your gonna be hard pressed to find wheels with loads of tread for less then that. Are you having a laugh mate, i have just sold 4 x 17' wheels(no tyres) to a lad in Germany for £200 & he paid me £100 to post them to him. You would be very lucky to get 16' wheels with 205/50/16 for £30 a wheel and tyre combined . If you live in Rugby i am 10 miles from you and can pop over and you can see the 4 continental supersport 3's(205/45/17) which i got for £160 and they all have 7 mm of tread on them .Brand new they would have cost me over £600. £120 for 4 x 17' subaru wheels & tyres is dirt cheap and if they were stolen you wouldn't get them cheaper than that.If i was you I would buy them before the guy selling them comes to his senses .Just check out ebay/pistonheads,etc and see what wheels & tyres you can buy for £120. Last edited by midnight; 01 December 2011 at 10:57 AM. the 4 continental supersport 3's(205/45/17) which i got for £160 and they all have 7 mm of tread on them .Brand new they would have cost me over £600. That's quite good where is that place. I'm assuming they are test tyres and not bran spanking new. With that amount of tread they are better then the part worns we get here. 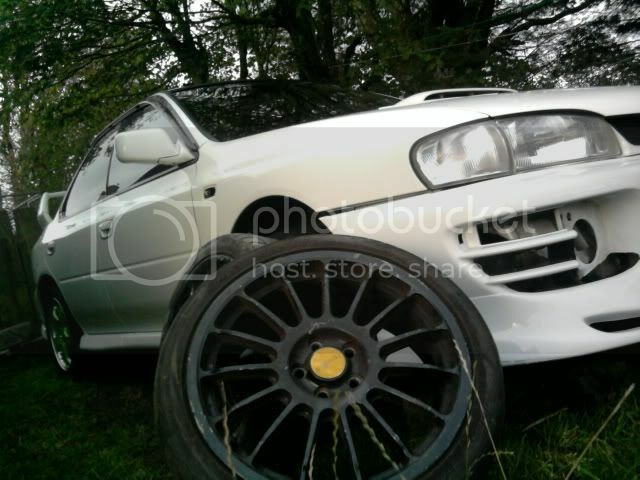 Not sure about price ,maybe £80.00 a side /as for condition they are in vgc with no seizure, sticking pistons or leaks.They were taken off a 1995 wrx auto,to fit on to another wrx ,but my mate is happy with his std grooved & pads set up.Cant think why but each to there own. Quick Reply: 17" Wheels with GOOD tyres urgently needed,today? ?